The United States Congress designated the Indian Mounds Wilderness (map) in 1984 and it now has a total of 12,214 acres. All of this wilderness is located in Texas and is managed by the Forest Service. Prior to 1930, before loggers had worked their way through the area, longleaf pine, beech, oak, and magnolia trees supported a vigorous turpentine industry. Today, Indian Mounds Wilderness safeguards a few acres of lovely old-growth trees near the edge of the Toledo Bend Reservoir, close enough to the state line to lose a few pine-cones to Louisiana with a favoring wind. 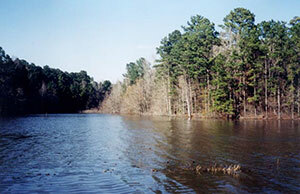 The trees around the reservoir vary, with loblolly and shortleaf pines on the periphery and hardwoods marking drainages created by Indian Creek, Bull Creek, and Hurricane Bayou. You may even find a mature grove of American beech trees or the fabulous yellow lady's slipper (a member of the orchid family). One thing you probably won't see is the endangered red-cockaded woodpecker--the colony that lies in the area has been inactive for years. Both the Indian Mounds Recreation Area, outside the southeastern border, and the Wilderness are named for their unusual "hills," once thought to be the handiwork of a prehistoric people and later confirmed to be the result of natural processes. The Wilderness is cut like a jigsaw puzzle into seven sections along three non-Wilderness roads and a gas-pipeline corridor. Abandoned roads offer hiker and horse access, and boats can get to parts of the area via the reservoir. Planning to Visit the Indian Mounds Wilderness? How to follow the seven standard Leave No Trace principles differs in different parts of the country (desert vs. Rocky Mountains). Click on any of the principles listed below to learn more about how they apply in the Indian Mounds Wilderness.